This entry was posted in Stephen Sweeney and tagged Asch, Autobiography, Bound for Glory, Guthrie, Moses Asch, Salt Lake Tribune, Woody, Woody Guthrie by Stephen Sweeney. Bookmark the permalink. As I mentioned in class, I think you could put some critical pressure on both primary sources. 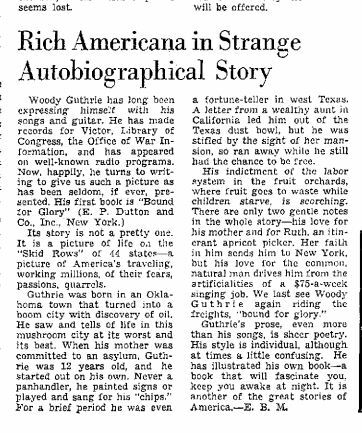 The review is celebrating Guthrie’s folkiness at a time when he was actually establishing himself in New York, settling down with a family, and starting to achieve financial success as well as real notoriety. Asch, too, has a stake in gesturing towards what’s “authentic” about folk music, even as he’s participating in the process of transforming the genre into a popular, commercial one. Finally, relating to nothing in particular, the title of Guthrie’s autobiography is a reference to a gospel song written in the early 20th century and popularized by the Lomaxes. It became widely known during the 1960s folk revival and was covered by lots of people (including Rosetta Sharpe, Johnny Cash, and most recently, Mumford and Sons). It might be need to include an archival recording of the song, even though it’s not a Guthrie song, because it’s clear he found the song important. I couldn’t find one through National Jukebox, but maybe DRAM or the American Song collection would have it.